You’re not often lucky enough to get Sir Elton John, a Mississippi Senator, an “Ole Miss” football helmet, pink sunglasses and a baby grand in the same place. Today, in the impressive office of Senator Thad Cochran, I was lucky. 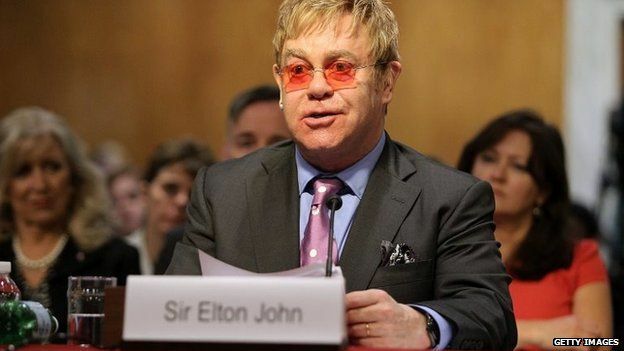 Sir Elton had been testifying before the US Senate on the need for more Aids funding. When I suggested it wasn’t easy to be passing round the hat for donations in an era when cuts were more popular than cash, Sir Elton was quick to push back – the fight against Aids, he said, consumes just 1% of the US budget. And the money has been put to good use. There’s been remarkable progress in this field since the pop superstar first testified before Congress in 2002 – treatment rates are up worldwide and infection rates are down. Indeed, Sir Elton believes he could see the end of Aids in his lifetime. A bit ambitious, I suggested. No, he said, and if he didn’t believe it was possible, he wouldn’t be trawling the marble corridors of Capitol Hill. But he is also concerned that we are at a moment of risk – one where the progress of the past decade has made us almost complacent. When Sir Elton isn’t lobbying for Aids funding, he is taking on famous Italian designers. A month ago he got into a very public row with fashionistas Dolce and Gabbana, who’d called babies of IVF “synthetic” and said gay couples shouldn’t raise children. Sir Elton shot back furiously. Now, he told me, he believes the designers regret their comments and he says an olive branch will be extended at some time “because life is short”. He says he hasn’t, however, heard anything from them personally.